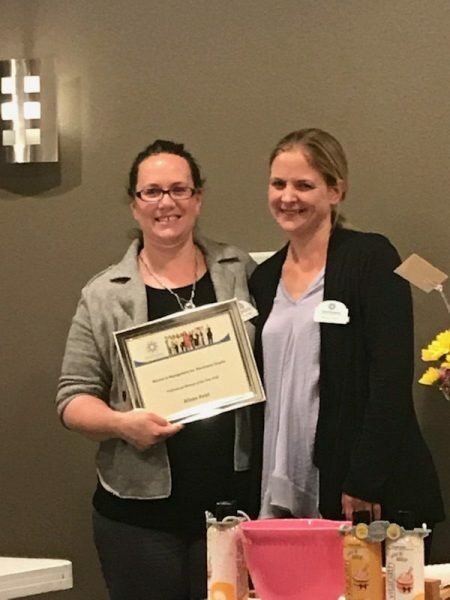 Attorney Alison Petri was awarded the Professional Women Of The Year Award, presented by the Women In Management, Manitowoc Chapter. Partner Michelle Birschbach nominated Alison for the prestigious award. Read why she nominated Alison! I have had the joy and privilege of working with Alison for a number of years. She began as an associate attorney at Steimle Birschbach and just this year, through her hard work and commitment, she was promoted to Partner! Alison is smart, witty, creative, ethical and an excellent attorney and community leader. But it’s her expansive heart that I appreciate most! At the office, Alison takes on extra projects like writing blogs; leading our annual educational symposium; volunteering at the senior center; and mentoring our staff to help them become better leaders. In the community, Alison is quick to participate in events that support local charities like the Woodland Dunes Tropical Blast; she takes leadership roles in organizations that are important to her like WIMI and Junior Achievement; she recently participated in the CP Telethon; and sometimes you can even talk her into swimming in a local triathlon relay to support the community. At home, she’s an amazing mother — creating fun experiences for her 3 children like trips to a planetarium and letting them express themselves through hair dye; leading her daughter’s Girl Scout troupe; and being actively involved in all of her children’s school activities. On top of all of that, she recently adopted two adorable kittens to add to her fur baby collection of a dog and a gerbil named Bob. Alison is a cherished colleague, my business partner, a fierce defender of her clients, a wife, a mother of both littles and furries, an active participant in this community and a dear friend. Hopefully, I can add WIMI Professional Woman of the Year to that list!